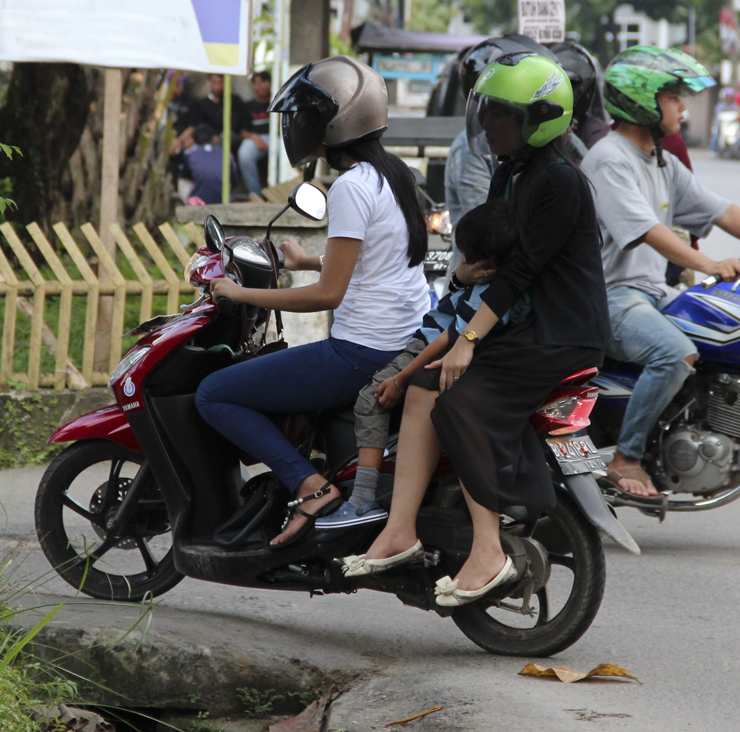 The city of Lhouksemawe in Aceh province is implementing a law that forbids women from sitting astraddle the back of a motorcycle. Instead, female passengers must ride sidesaddle, a less comfortable and more dangerous position. Aceh, where almost 99 percent of residents are Muslim, is the only province in Indonesia governed by Shariah, or Islamic, law. National officials and rights groups are speaking out against the ban, which is now being imposed on a 3-month trial basis. In the provincial capital of Banda Aceh, it’s hard to find a resident who agrees with the Lhouksemawe straddling ban. Shariah by-laws – which vary from district to district throughout the province – are less archaic here and less strictly enforced. In 2007, the city stopped the spectacle of public punishments, such as canings. Several women bare their hair in public without fear of legal repercussion, and the deputy mayor is a woman (the only elected female officeholder in Aceh). Razi is the headmaster of a religious boarding school and a father of three. Though he believes Aceh is experiencing “moral degradation” – unmarried young couples pressing their bodies against each other atop motorcycles being one indication — Razi considers the Lhouksemawe law ill conceived, as physical contact is permitted for married couples and family members. Novia, a graduate student, is angry. She asserts the ban is not rooted in “Islamic values” but in political opportunism. “(The mayor) just wants to look religious so he gets elected again because in Lhouksemawe there are many conservative people,” she said. Riza, a middle-aged guesthouse owner in Banda Aceh, believes the act is “unnecessary.” According to him, some Shariah regulations are politics encroaching into social life. “(Acehnese) people have followed the laws of Islam for hundreds of years. We don’t need [the government] to tell us to follow them.” Despite heated opposition, the straddling ban looks poised to take full effect, but the debate about Shariah is sure to continue.